Location : In the north Indian state of Uttaranchal. Nearby Tourist Destinations : Mayapuri, Kankhal, Rishikesh, Devprayag, Mussoorie, Dehradun. Haridwar located in the foothills of the Himalayas in the north Indian state of Uttaranchal represents the point where the Ganga reaches the plains. Haridwar is an ageless pilgrimage destination, held in reverence for centuries. Several temples and ashrams are found in this town and a visit to Haridwar is like stepping into a comletely different world. Once known as Gangadwara, Haridwar (and Rishikesh) represents the gateway to the Himalayan pilgrimage shrines of Badrinath and Kedarnath. 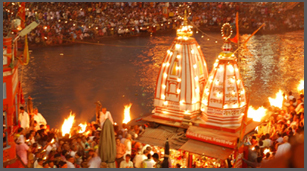 Haridwar has very rich ancient religious and cultural heritage. Har ki Pairi Ghat - HaridwarIn the ancient scriptures of India, this place is well known by the name of Mayapur. This city is also well known for many other things apart from the holy river Ganges. Besides this, Kumbh fair is organised at the interval of every 12 years in this city in which about 1 crore pilgrims from all over the world participate. Har Ki Pauri is one of the most sacred ghats in India. It is said that this ghat was built by Vikramaditya in memory of his brother Bhartrihari. Also known as Brahmakund, the Ghat is magnificently illuminated in the evening during a Maha Aarti performed on this ghat. It is an event which is a must, not be missed by any visitor. Located on top of a hill called the Bilwa Parvat, the Manas Devi Temple is worth visiting. The temple can be reached by the rope way or one can take the normal trekking route to the top. The top of the hill gives you an excellent view of Haridwar. On the top of a hill called the Neel Parvat which is on the other side of the river Ganga, the Chandi Devi temple was constructed by the King of Kashmir, Suchat Singh, in 1929 AD. Chandi Devi is a 3 km trek from the Chandi Ghat. At one place Ganga divides herself into seven small streams. This place is known as the Sapt Rishi and provides a very pleasing sight. Maya Devi Temple is one of the Shaktipeeths in India. This ancient temple of Maya Devi is also the Adhisthatri deity of Haridwar. It is said that when Lord Shiva was carrying his wife Sati, who had burnt her self to keep the honour of her husband, then the heart and navel of Sati had fallen at this place. Women performing puja at HaridwarAt a distance of 4 kms from Haridwar is a town called Kankhal. It is said that the king of this place King Daksha Prajapati performed a yagya. His daughter, Sati was married to Lord Shiva. But Daksha was not happy with this marriage and did not invite Shiva-Sati in the Yagya. But Sati came and was insulted by her father. She could not take the insult and burnt herself in the yagya kund. On knowing this Shiva's followers killed Daksha. But later Mahadeo (Shiva) brought Daksha to life. The Daksha temple is a mark to this legend. This place is one of the five sacred places in Haridwar. Air : Domestic airlines operate flights between Delhi and Jolly Grant airport in Dehradun. These flights are available only on Tuesday, Thursday, and Saturday. Rail : Haridwar is connected to almost all part of Uttaranchal by rail links. Road : Haridwar is well connected by road. From Delhi you can reach Haridwar by bus, car, or taxi through Ghaziabad, Meerut, Muzzaffarnagar. It takes nearly 6 hours by bus or car. 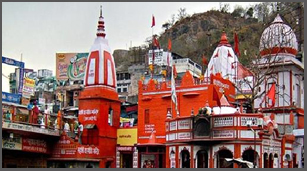 Haridwar has numerous accommodations located in & around the town. We offers you best accommodation in the Haridwar. The accommodations available here ranges between luxury and budget. The hotels offers good length of facilities and services which are ideal for both short and long journeys. Pick the one which is most ideal for you.